The box seemed to be of normal weight. 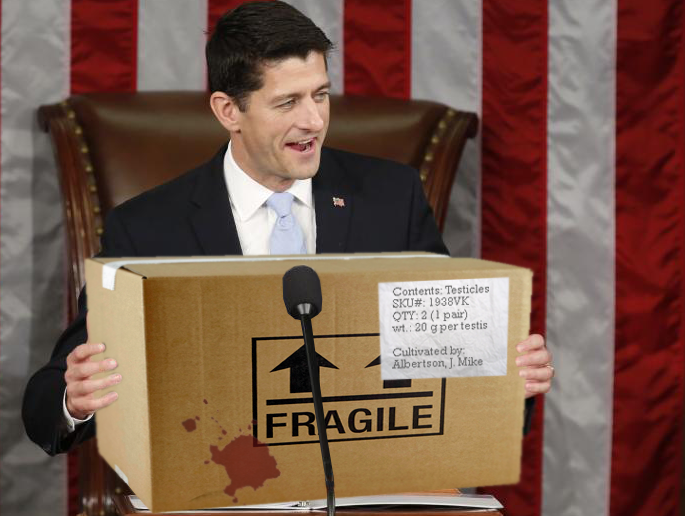 With President Trump in the White House and the country increasingly divided, here’s some heartwarming political news we can all feel good about: one of House Speaker Paul Ryan’s Wisconsin constituents donated his testicles to the Congressman. Mechanic Mike Albertson said he had grown worried about Speaker Ryan’s despondency and lack of courage in standing up to President Trump, a man who he was openly critical of during the past year’s election. Beautiful — a charitable donation to a public servant who has donated his life to fighting for all Americans. Ah, those darned politicians always finding legal loopholes! By the time the balls were returned to Albertson, however, he was undeterred and already hard at work researching the possibility of a spine donation.